The flag of Manchurian Transport Vessels is yellow with two black serrated lines. This is also according Flaggenbuch 1939. Adopted 22 October 1935. Note: Flaggenbuch, 1939, [neu39] shows this flag having blue serrations. This is a reported error. The Airline Timetable Images site presents the Manchurian Air Transport Co. aka Manchukuo National Airways - this page one shows an enlarged brochure showing the roundel in the national colours and the rudder flag or flag rudder! Another link to a baggage (luggage) label page shows more flag motifs, including the company arms begging the question, was a company flag used alongside this flaggy shield? 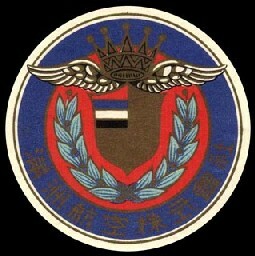 More on this airline (1932-1945) here - it seems to have been more paramilitary than civilian. The first Japanese penetration in Manchuria was through the railways of the region that after the Russian-Japanese war of 1905 fall in hands of Japan (Portsmouth Treaty). The South Manchurian Railway Co., a organization near under government control, was created in April 1908 and adopted this flag. A white flag with a red logo in the center, reminding superimposed latin letters M and I. Or a winged I. The South Manchuria Railway was once a politically important company. What interests me for the moment is the logo, which seems to be composed of the initial 'M' and the silhouette of a rail. I think in it is a stylized rail profile. Its head office located in Dalian. The white flag charged with a track and letter M in red in the center. Northern China Railway Co. was created in 1938 and was under Japanese military control. The company adopted and used this flag. White with a black logo centered, consisting of a thick ring and 4 bars coming from the ring's upper half and poiting to the fly (or the right, in case this logo has to stay like this in both sides of the flag). I guess this represents an winged (railroad) wheel. Not unlike the Soviet Union/Russia Transports Ministry emblem. Its head office located in Beijing. The white flag charged with a circle and four horizontal lines in black. Japan put the Railway of Central China under military Control. The Central China Railway Co was created April 1939 and adopted this flag. White with a red logo centered. Its head office located in Shanghai. The white flag charged with a track and stylized kanji Ãæ= central in red in the center.